This page (below) is a legacy page, and doesn't include the most recent issues of EAB Update. For the most recent issues, please visit the non-legacy site's downloads page. 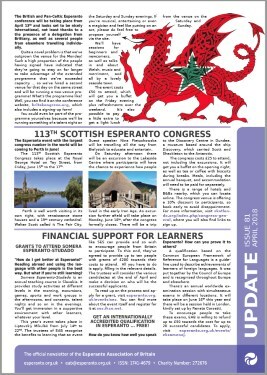 EAB Update is the quarterly newsletter of the Esperanto Association of Britain, and is sent to all EAB members and supporters. The views expressed in EAB Update are not necessarily those of the Management Committee of EAB. Material for Update should be sent (preferably by e-mail) to the editor: Tim Owen (tim.owen esperanto.org.uk). This newsletter's content is aimed at both members and supporters of EAB, so its content is usually in English. EAB also publishes the review La Brita Esperantisto, wholly in Esperanto, and posts brief announcements on our Twitter group. Only EAB members or supporters can access the current issue of EAB Update on-line. If you are an EAB member or supporter, please contact the EAB office to learn the current user-name and password details. You can browse an archive of back issues as PDF files, but be warned that (depending on the number of pages and photos) the files can vary in size from 300KB to 6MB. This list (below) is a legacy list, and doesn't include the most recent issues of EAB Update. For the most recent issues, please visit the non-legacy site's downloads page.